PicoScope has a large, high resolution display. The easy to use interface can be controlled by mouse, keyboard shortcuts or touchscreen. 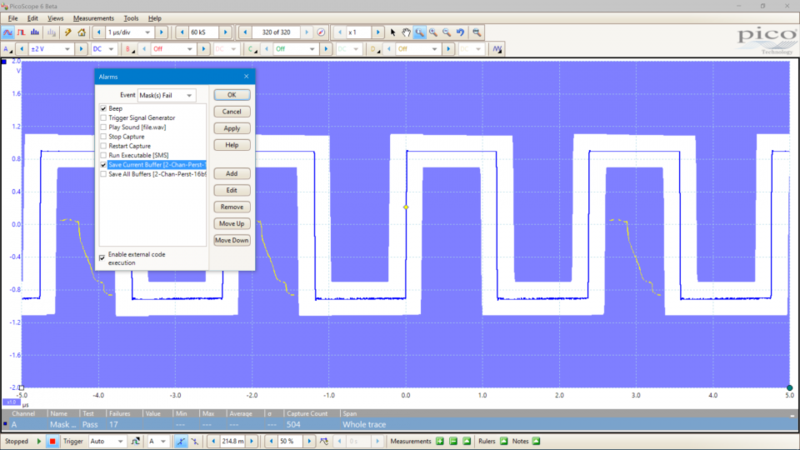 Each channel has independent draggable rulers for amplitude measurement. 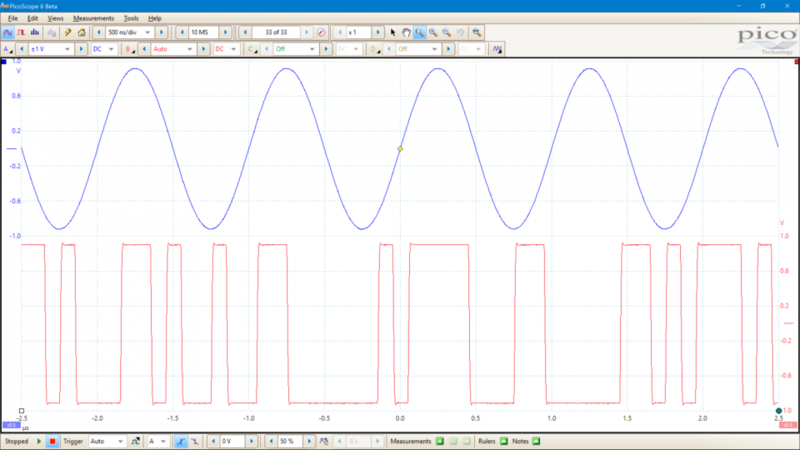 Vertical rulers can measure time, percent (for duty cycle) or phase in degrees. Mixed signal example. 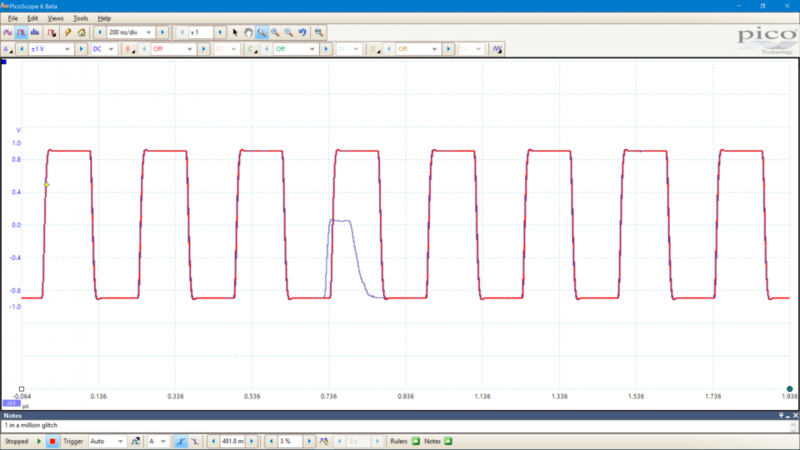 The blue trace is the input signal to an ADC. 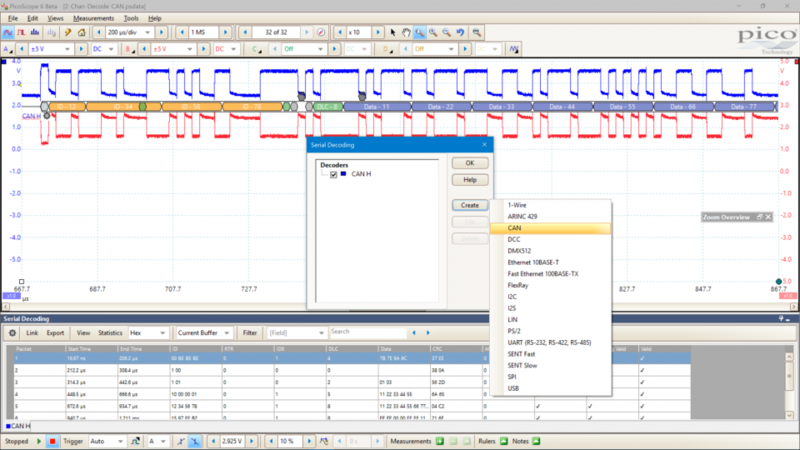 Digital channels monitor the ADC output. The green channel is a math channel re-constructing the ADC data (only most significant bits shown for clarity). Resolution enhancement. 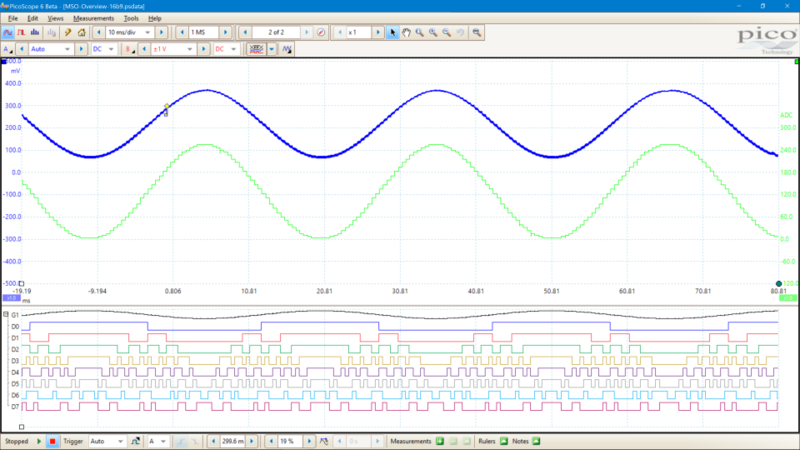 In this example the blue trace has been enhanced to 12 bits. 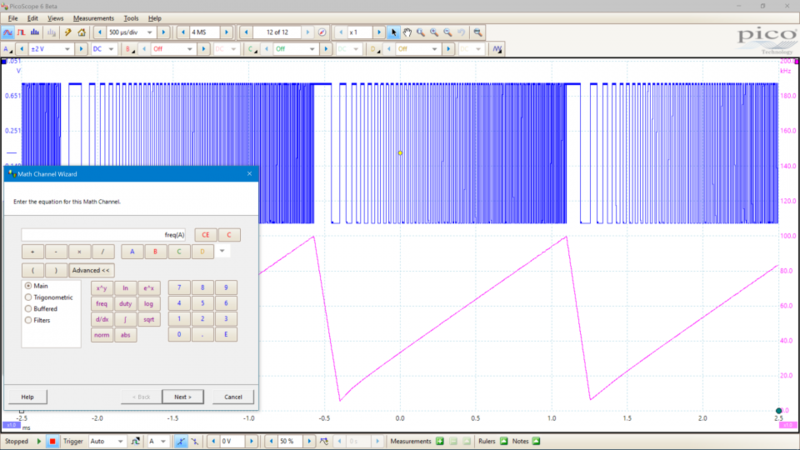 This can be seen most clearly in the zoomed waveform. 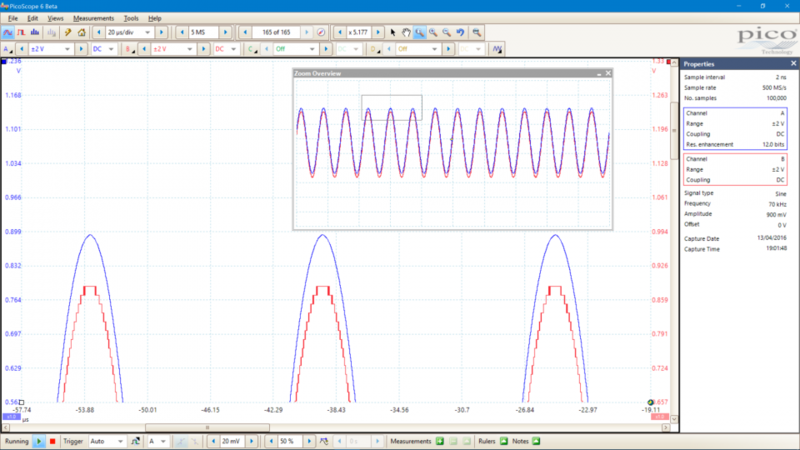 Oscilloscope zoom. 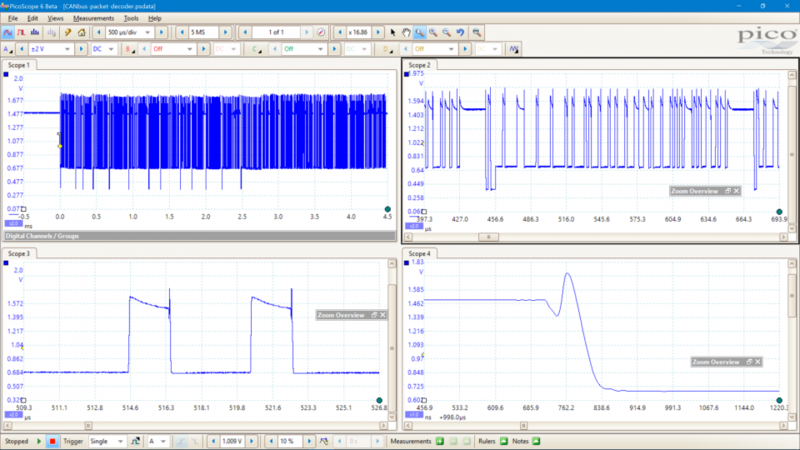 Four views of the same signal with increasing levels of zoom. With a mouse you can draw a box around the area to zoom. 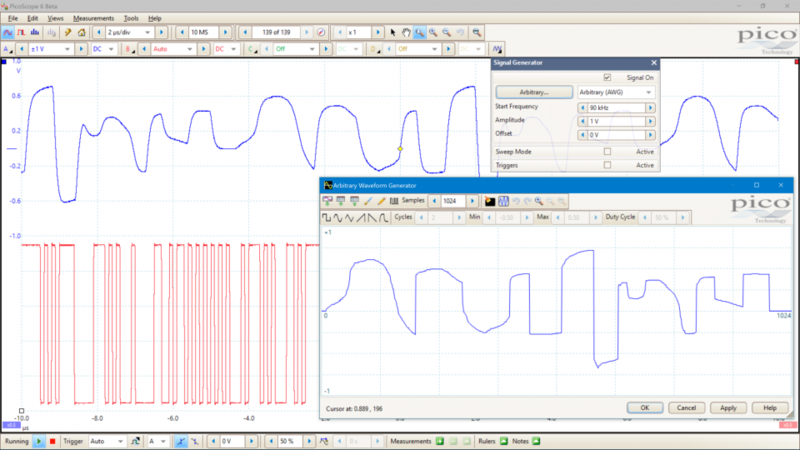 With a touchscreen you can pinch and pull waveforms or drag to pan. 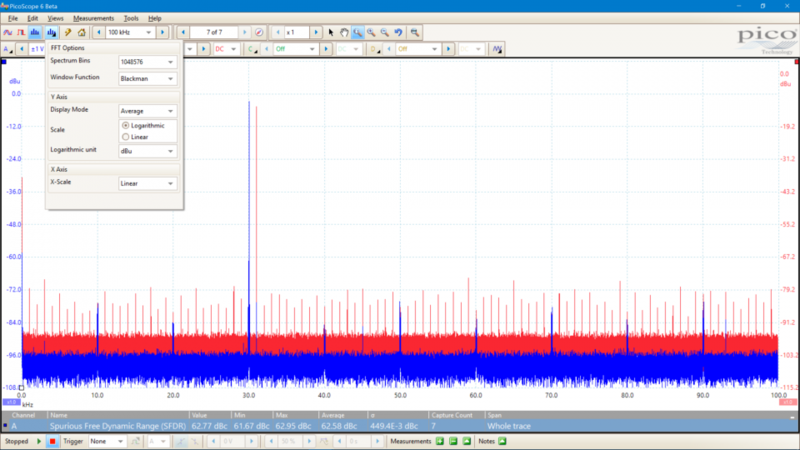 Spectrum view. Increasing the number of spectrum bins improves frequency resolution and reduces the noise floor. 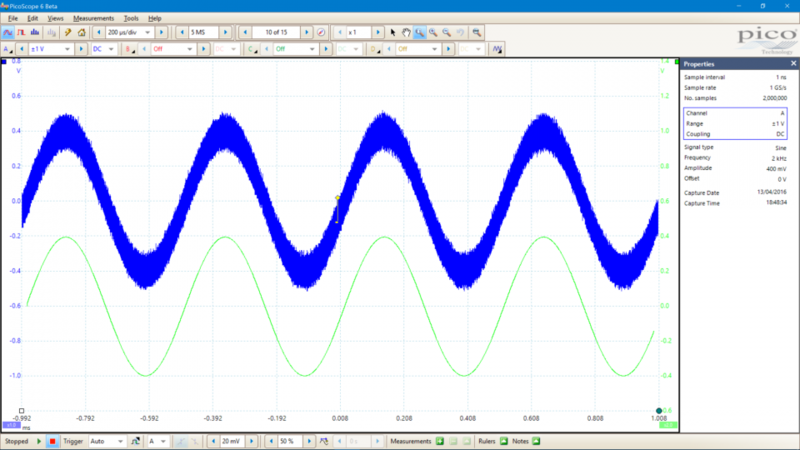 Options such as peak hold can be used with the signal generator to plot amplifier frequency response. 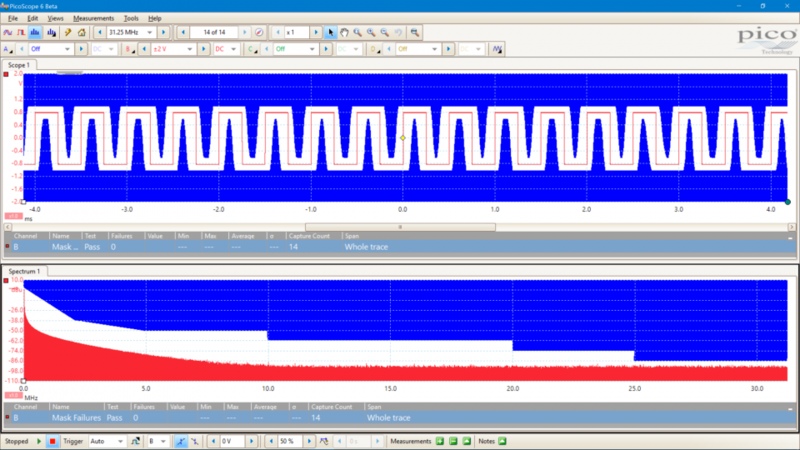 The measured signal (blue) has a significant amount of noise that has been removed by adding a software lowpass filter. This allows both the live and filtered signals to be viewed at the same time. 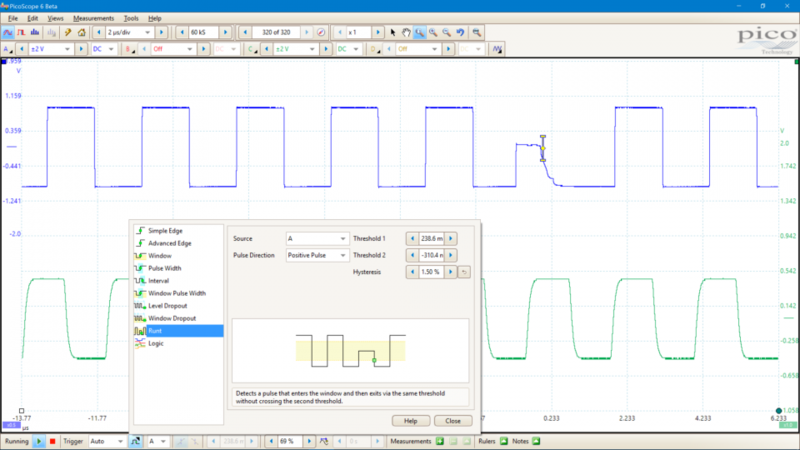 Alarms provides several actions that can occur when a waveform fails a mask test. 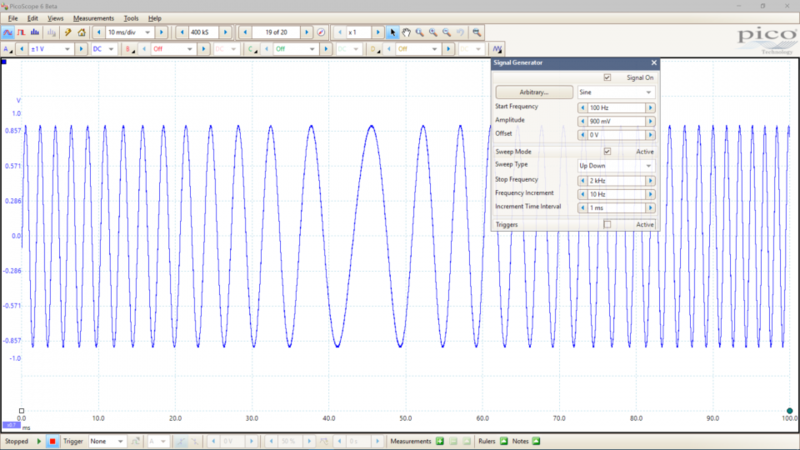 The PicoScope 2000A models can capture up to 2000 waveforms per second, whilst the 2000B models use hardware acceleration to boost this to 80 000 waveforms per second. In both cases these are the fastest waveform update rates available at this price point. 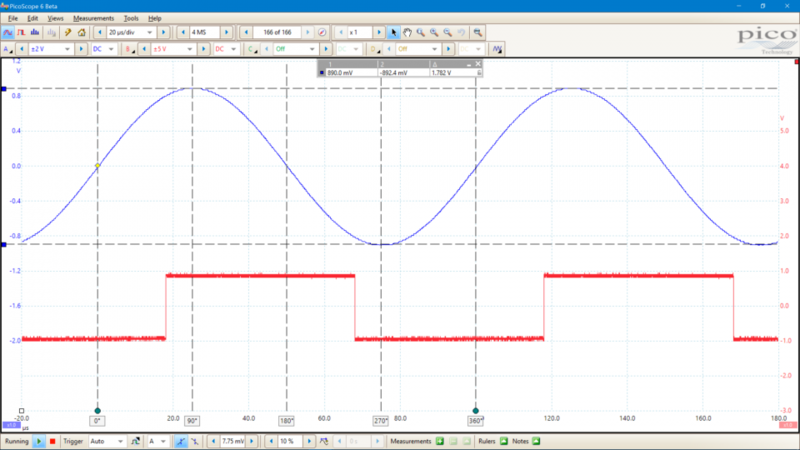 PicoScope 2000B model oscilloscopes have waveform buffer sizes up to 128 million samples – many times larger than competing scopes of either PC-based or traditional benchtop design. 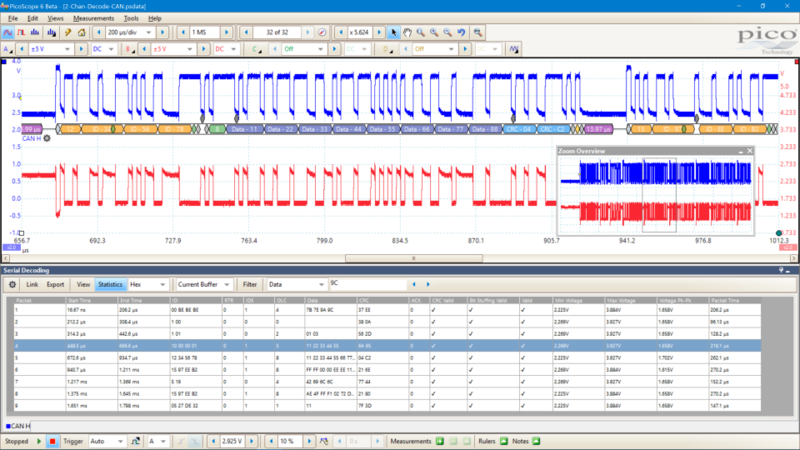 Deep memory produces several benefits: fast sampling at long timebases, timebase, zoom, and memory segmentation to let you capture a sequence of events. 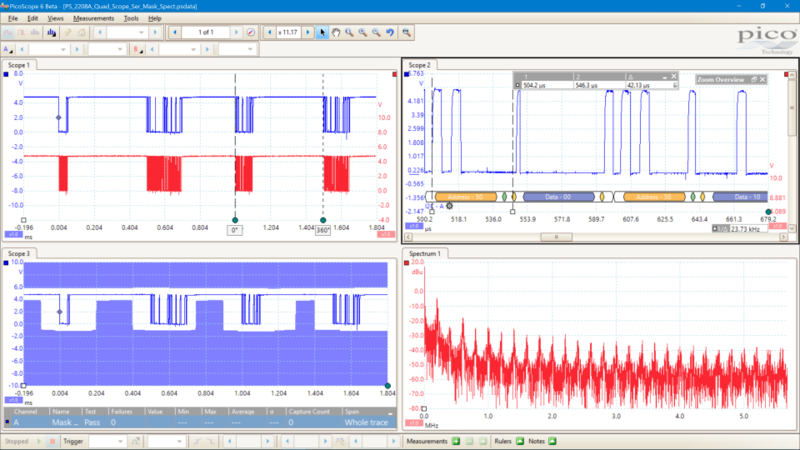 Deep memory oscilloscopes are also ideal for serial decoding applications as they allow the capture of many thousands of frames of data. 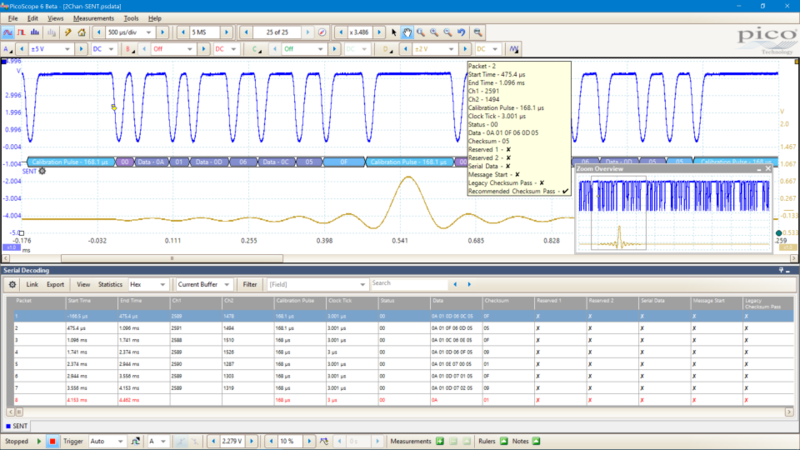 The lower cost / bandwidth PicoScope 2000A models have smaller internal memories but when sampling at rates of less than 1 MS/s use USB streaming and PC memory to provide a 100 million sample buffer.